Simeon Kambula had grown up in Edendale, the Methodist Mission Station near Pietermaritzburg. His father, Elijah Kambula had served as respected personal interpreter to Major A W Durnford, RE, during the Langalibalele Rebellion of 1873, and had been killed in the ambush on the Bushmans River Pass in the Drakensberg on 4 November 1873, despite Durnford’s efforts to rescue him. In November 1878, as war clouds gathered over Natal and Zululand, Durnford, now promoted Lt Colonel, was asked to raise a force of up to 7 000 Natal Natives for service in the imminent Zulu War. Those recruited for the various regiments of the Natal Native Contingents – many of whom proved to be totally unreliable and were soon disbanded – were Infantry. There were, however, a few mounted groups who gave useful service. The most successful of all was the contingent from Edendale, which formed the Natal Native Horse – the only black unit to serve faithfully throughout the war. Volunteers were quickly forthcoming. Within a few days a fine body of some one hundred young men, mounted, accoutred and uniformed at their Elders’ expense, complete with boots and spurs, gathered to receive their Missionary’s blessing at a solemn service in the Edendale Church. Then off they marched to war, with their leader John Zulu at their head, and Sergeant Simeon Kambula as senior NCO in their ranks. Their baptism of fire was not long in coming. Durnford and the mounted men of his Column had come forward from Helpmekaar to a camp near Rorke’s Drift. On the fateful morning of 22 January, 1879, he advanced to Isandlwana on instructions from General Chelmsford, who had himself moved forward with half his force on a wild goose chase. Durnford reached Isandlwana about 10h00. As senior officer on the spot, he had to take command of a totally unprepared camp, already closely threatened by the main weight of the Zulu army. The disaster which followed is now part of history. The Edendale Contingent had been given a key position. Despite heavy casualties they held it courageously against repeated attacks. But soon the units around them broke before the Zulu horde, and it was clear that the battle was lost. The battlefield was running red with blood, the two officers gone, presumably dead. Sgt Simeon Kambula found himself in command of the survivors. He resolved to save them if he could. ‘He addressed them and told them their lives depended on obedience and keeping together, and that any man who strayed from the ranks was doomed. If it was God’s will and they would obey, he would bring them through into Natal. They pledged their word to abide together with him that day for life or death. But he must, if possible, get ammunition. He saw an ammunition wagon, and noticed the Zulus were too busy in the tents to bother about this wagon. He rode up with his men, and found no one there but a little drummer boy who sat on top of the wagon and said he was in charge. Simeon asked him to give him and his men a packet of cartridges each, just to help them defend themselves. But the little boy informed them that this ammunition belonged to the 24th Regiment, and as long as he was in charge no one else should have any of it. He felt the boy was obeying orders, and respected him. Then he saw there was a loose lot of cartridges lying in the grass around the wagon. Men who had come for cartridges were in such haste to fill their belts that they dropped many on the ground. So Simeon and his men each picked up a few and put them into their belts. Simeon’s heart went out to the boy who was sticking to his post of duty. He told him the battle was lost, the camp was in the hands of the enemy, the fighting all over, and, indeed, his was the only body of men holding together. He begged the boy to leave the wagon, and he would take him in front of the saddle, and as long as he had life he would defend him. The boy was surprised and hurt that anyone could think he would desert his post. His officer had placed him there, and no one should move him out while he had life. With a very sad heart Simeon had to leave him there. Brave young soul! I salute thee, for it is souls like thine, which have won the Empire! Simeon knew the country, and avoiding as best he could Zulus in force, made, by paths known to himself, to what afterwards became known as “The Fugitive’s Drift”. It is a ford over the Blood River [sic. should read ‘Buffalo River’]. Before they reached the Drift, they heard the yells of men, the neighing of horses, and the bellowing of cattle. When they arrived upon the banks above the Drift they found it choked with men and beasts. On every rock stood two or three Zulus, stabbing every man they could reach, while on the Natal bank of the river a large body of Zulus waited to dispatch every man who escaped from the river. 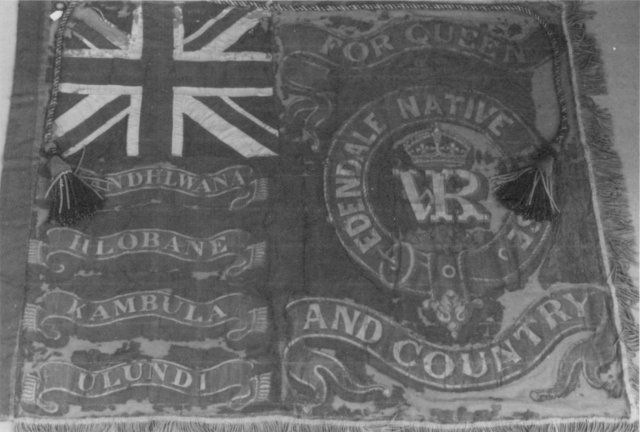 This colour, donated by Mr Robert Topham, was presented by Major General Sir Evelyn Wood, VC, KCB, Governor of Natal, in the name of the Queen ‘to the officers and troopers of the Edendale contingent of the Natal Native Horse’ at Edendale on 15 December 1881. ‘The flag having been unfurled, was delivered by the General to Sergeant Major Simeon Kambula, and Sergeants Simon and Enoch, who knelt before His Excellency. The choir sang the National Anthem’ (The Natal Witness, Saturday 17 December 1881). Owen Watkins went on to record that calling other fugitives to cling to the stirrups of his men, Simeon led his Contingent through the fast-flowing river, then formed them up on the far bank to fire a final volley at the pursuing Zulus. Their ammunition exhausted, he then led them off to Helpmekaar, the only group to maintain their cohesion through the great Zulu victory of Isandlwana. There was grief in Edendale over their many young men who did not come home, but volunteers came forward immediately to replace the fallen, and the Contingent was soon off to war again, this time under command of Capt Cochrane, 32nd Regt, to operate with Col Evelyn Wood VC in the North, at Fort Kambula. They served with Wood – in the final advance as part of his ‘Flying Column’ – until the final defeat of Cetshwayo at Ulundi on 4 July 1879. Promoted Sergeant Major, Simeon Kambula fought with Major Redvers Buller at the Battle of Hlobane Mountain on 28 March, but got safely away with most of the force, to Kambula. The following day, 4 July, the Edendale Contingent was in action again, as Chelmsford moved his famous square past the Nodwengu kraal to the open ground in front of Ulundi. Sensing an easy victory, a repeat of Isandlwana, the Zulu impis hurled themselves at the exposed square. But they had not reckoned with the devastating effect of disciplined and controlled volley fire by the well-drilled British infantry. None reached closer than thirty paces. The attack began to falter. Then Chelmsford launched the 17th Lancers, as hesitation changed to retreat and soon to rout. ‘In this pursuit’ states the official report, ‘the efficacy of the lance as a cavalry weapon was abundantly proved.’ Buller’s mounted men with the Natal Native Horse to the fore mopped up behind the Lancers. The Edendale men were the last to return to camp at the close of that well-fought day. Some 1 500 Zulus died on the battlefield. The Zulu military power was shattered. The Zulu War of 1879 was over. Soon the Edendale Contingent could return home to be welcomed as heroes by their Elders and their people. They were given a banquet in Durban ‘for having given good service at the chief action of the campaign’. Simeon Kambula had truly served ‘The Great White Queen’. In due course he received the Distinguished Conduct Medal ‘from the hands of an English General’, wrote the Rev Owen Watkins, ‘at a grand parade of the troops. Had he been a white man, he would have received The Victoria Cross’. The Zulu War and the Colony of Natal (Natal Provincial Administration). O Watkins, article in The Methodist Reader. Narrative of the Field Operations connected with the Zulu War of 1879,(London, 1881). D R Morris The Washing of the Spears (London, 1966).